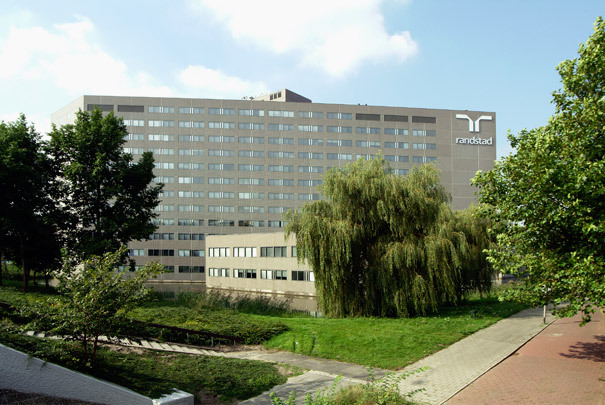 The Randstad service company sought an architect able to process its corporate image in the design for its new premises. This 'Randstad philosophy' is expressed in the architect's fine focus on a healthy physical climate and the functional though ultra-sensitive detailing. The composition of volumes is dominated by the standard office slab which nonetheless achieves the right degree of tension through its rigorously chamfered ends and the separate volume of the lift tower set obliquely to it. The openness called for in the brief is best expressed inside, in the semi-public zone on the first and second floors linked as these are by a circular well. The building was enlarged in 2002.